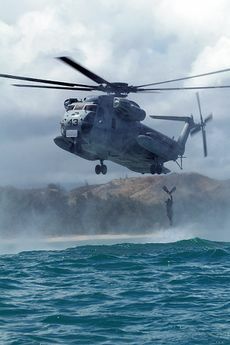 A pair of CH-53D Sea Stallions approach a landing zone in Hawaii, 2004. The CH-53 Sea Stallion is the most common name for the Sikorsky S-65 family of heavy-lift transport helicopters. Originally developed for use by the United States Marine Corps, it is also in service with Germany, Iran, Israel, Mexico, and as the MH-53 Pave Low with the United States Air Force. The USAF also operated the HH-53 "Super Jolly Green Giant" during the late- and post-Vietnam War era. The dimensionally-similar CH-53E Super Stallion is a heavier-lifting, improved version designated S-80E by Sikorsky. Its third engine makes it more powerful than the Sea Stallion, which it has replaced in the heavy-lift mission. In 1960, the US Marine Corps began to seek a replacement for their old S-56 piston-powered helicopters, originally working with the other three U.S. armed services on the "Tri-Service VTOL transport", which would eventually emerge as the Vought-Hiller-Ryan XC-142A tilt-wing. The design became more elaborate and the program stretched out resulting in Marines deciding they couldn't get a workable machine in a satisfactory timeframe and dropped out. This was just as well, because the XC-142A, although a very innovative and capable machine, would never enter production. In March 1962, the US Navy Bureau of Weapons, acting on behalf of the Marines, issued a request for a "Heavy Helicopter Experimental / HH(X)". The specifications dictated a load capability of 8,000 pounds (3,630 kilograms) with an operational radius of 100 NM (185 km) at a speed of 150 kt (278 km/h). The HH(X) was to be used in the assault transport, aircraft recovery, personnel transport, and medical evacuation roles. In the assault transport role, it was to be mostly used to haul heavy equipment instead of troops. 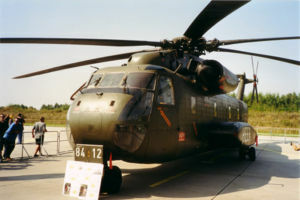 In response, Boeing Vertol offered a modified version of the Chinook; Kaman offered a development of the British Fairey Rotodyne compound helicopter; and Sikorsky offered what amounted to a scaled-up version of the S-61R, with twin GE T64 turboshafts and the dynamic system of the S-64, to be designated the "S-65". Kaman's proposal quickly died when the British government dropped its backing of the Rotodyne program. Competition between Boeing Vertol and Sikorsky was intense, with the Boeing Vertol having something of an edge because the type was being acquired by the U.S. Army. Sikorsky threw everything into the contest and was awarded the contract in July 1962. The Marines originally wanted to buy four prototypes but ran into funding problems. Sikorsky, determined to keep the deal, cut their estimate for development costs and said that the program could be done with two prototypes. The military bought off on the proposal, and in September 1962 Sikorsky was awarded a contract for a little under US$10 million for two "YCH-53A" prototypes, as well as a mockup and a ground-test airframe. The development program did not go entirely smoothly, due to a shortage of engineering resources plus various failures of subcontractors and the government, but these problems were gradually overcome. There was also the problem that U.S. Defense Secretary Robert S. McNamara was pushing "commonality" between the armed services and pressuring the Marines to obtain the Chinook anyway, but the Marines managed to convince McNamara's people that the Chinook couldn't meet requirements without a lot of expensive changes. All these obstacles overcome, the first YCH-53A performed its initial flight at the Sikorsky plant in Stratford, Connecticut, on October 14, 1964, about four months behind schedule. The Marines had already placed an initial production contract for 16 helicopters in September. Flight trials went more smoothly than expected, helping make up for the lost time in development. It received the military designation and name "CH-53A Sea Stallion". Delivery of production CH-53s began in 1966. The CH-53A arrived in Vietnam in January 1967 and proved useful, eventually recovering even more downed aircraft than the CH-54. A total of 141 CH-53As were built, including the two prototypes. The US Navy acquired 15 CH-53As from the USMC in 1971 for airborne mine countermeasures (AMCM) activities. The helicopters had more powerful T64-GE-413 turboshafts installed and the received the designation "RH-53A". The USAF ordered the HH-53B in September 1966 and first flew on March 15, 1967. It added a refueling probe, drop fuel tanks and a rescue hoist and featured upgraded T64-GE-3 engines. The Air Force used the HH-53B for combat search and rescue (CSAR). HH-53C was an improved CSAR variant with a smaller 450 US gallon (1,705 liter) for improved performance. It also added more armor and better communication systems. The CH-53C was similar except it lacked a refueling probe. It was used by the USAF for more general transport work. Heavy lifting in tropical climates demanded more power so the Marines decided to acquire an improved variant, the "CH-53D", with uprated engines, originally the T64-GE-412 then later the T64-GE-413. The CH-53D also included an uprated transmission to go with the more powerful engines, and a revised interior to permit a load of 55 troops. A HH-53 of the 40th Aerospace Rescue and Recovery Squadron as seen from the gunner's position in a helicopter of the 21st Special Operations Squadron, Vietnam, 1972. The initial flight of the CH-53D was on January 27, 1969. The CH-53D served alongside the CH-53A through the rest of the Vietnam War. A VIP transport version designated, "VH-53D" with plush accommodations was used by the Marines for the US presidential flights. The US Navy also acquired CH-53D based helicopters for mine sweeping. These were designated "RH-53D" and included mine sweeping gear such as a pair of Browning 0.50 in (12.7 mm) machine guns for detonating mines. The Navy received 30 RH-53Ds beginning in 1973. After the RH-53Ds were in service, the RH-53As were handed back to the Marines and restored to CH-53A configuration. During the 1980s, Israeli Air Force's CH-53 Yas'ur fleet was upgraded and improved by Israel Aircraft Industries, along with military high-tech firm Elbit Systems. The project – which ended only in 1997 – improved the CH-53 avionics, robustness and extended its life span by at least two decades. In 1989, some of the CH-53As being retired by the Marines were passed on to the U.S. Air Force for training, with these helicopters redesignated "TH-53As". The TH-53As were stripped of most operational equipment and painted in USAF camouflage colors. The Sea Stallion has a fuselage design similar to the Sikorsky S-61R/Jolly Green Giant series. It has a passenger door on the right side of the fuselage behind the cockpit and a power-operated rear loading ramp. The fuselage was watertight, though not intended for amphibious use, and only landed on water in emergencies. The Stallion has mechanical flight controls which are backed by two independent hydraulic systems. Armor protects crew and vital systems. The CH-53A carries a crew of four; pilot, copilot, crew chief, and "aerial observer", a load of 38 troops, 24 litters with medical attendants, an internal cargo load of 8,000 pounds (3,630 kg) or an external load of 13,000 lb (5,900 kg) on the single-point sling hook. The CH-53A is equipped with a pair of M60 0.308 in (7.62 mm) machine guns that point out to each side of the fuselage. The CH-53A features the six-bladed main rotor and four-bladed tail rotor proven on the S-64. To save space on board naval vessels, the tail boom and the rotors folded. The rotor system was initially driven by twin GE T64-GE-6 turboshafts providing 2,850 shp (2,125 kW) each, with an engine on each side of the forward fuselage. It was later produced with the T64-GE-1 with 3,080 shp (2,300 kW) and then the T64-GE-16 with 3,485 shp (2,600 kW). The HH-53B featured T64-GE-3 engines producing 3,080 shp (2,297 kW). CH-53D releasing flares near Naval Air Station Patuxent River, 1982. The CH-53D features uprated engines, initially T64-GE-412 with 3,695 shp (2,755 kW) then the T64-GE-413 with 3,925 shp (2,930 kW) with an uprated transmission. Its interior added seats to allow for 55 troops. CH-53Ds are generally armed with twin 0.50 in (12.7 mm) M2/XM218 machine guns. In later years, CH-53Ds have been fitted with defensive countermeasures including an AN/ALE-39 chaff dispenser and an AN/ALQ-157 infrared set. Later production CH-53Ds featured a Blade Inspection Method (BIM) scheme to detect cracks in its metal rotors. BIM involved pressurizing the interior of the rotor blades. If a crack is present pressure is lost and a red indicator on the rotor blade tip was tripped. Later, the BIM system was connected to a cockpit display. BIM reduced the need to swap out rotor blades on a routine basis. Further information might be found on the talk page or at requests for expansion. Please remove this message once the section has been expanded. This article has been tagged since September 2007. The CH-53/HH-53 has much combat experience during its lengthy service, with the U.S. military during the Vietnam War and as a Special Operations helicopter, and the Israeli Air Force. The CH-53D served alongside the CH-53A through the rest of the Vietnam War, with both types performing a final service at the end of the conflict in performing evacuations of personnel from Saigon and Phnom Pehn. U.S. Air Force HH-53 Super Jollies were the primary search-and-rescue helicopter in Southeast Asia between 1967 and 1975, inserted the Operation Ivory Coast rescue team into the North Vietnamese prison camp at Son Tay in 1970, and carried the Marines who attempted to rescue the crew of the SS Mayaguez. Marine-flown Navy Sea Stallions were the rotary-wing element of Operation Eagle Claw, the attempted rescue of American hostages in Iran in 1980 that ended in disaster and embarrassment at "Desert One". The CH-53 is operated by the U.S. Marine Corps and U.S. Air Force in support of Operation Iraqi Freedom and Operation Enduring Freedom in Iraq and Afghanistan. It is also operated by the U.S. Navy in support of Operation Iraqi Freedom and Operation Enduring Freedom throughout the region, deployed out of a squadron in Bahrain. In late February 2006, the Marine Corps announced that the V-22 Osprey, a tiltrotor aircraft, will be sent into combat within a year with VMM-263. The V-22 Osprey will replace the Marine Corps CH-46E and CH-53D. However, it will not replace the Marine Corps' CH-53E or the Air Force's MH-53 Pave Low helicopters. The new CH-53K is planned to update the Navy and Marine Corps' CH-53E by 2015. The CH-53D is due to return to the middle east in support of OIF. It will be performing the combat roles that the MV-22 is not able to conduct at this time. CH-53 helicopters joined the Israeli Air Force in August 1968 and were given the Hebrew name Yas'ur (Petrel). They are the main cargo helicopters of the IAF, carrying troops and heavy equipment. In 1969, during the War of Attrition, IAF Yas'ur CH-53s landed in Egypt and conveyed a captured Soviet advanced radar system back to Israel for examination by Israeli scientists and engineers (see Operation Rooster 53). In the 1973 Yom Kippur War, the Yas'urs moved artillery batteries around the fronts, evacuated wounded soldiers and rescued pilots from behind enemy lines. In one engagement, a Yas'ur was damaged by cannon fire from a MiG-21 but returned safely to base. Since 1973, Yas'urs have also been used by the IDF to land and extract Sayeret commandos on deep raids into Lebanon and Syria. In 1989, Yas'urs were used to fight a huge blaze on Mount Carmel. They performed dozens of low flyovers into the smoke and flames, dumped 700 tons of water on the fire, and doused it. Two prototypes with two 2850 shp T64-GE-3 engines. Initial production for USMC, 139 built. CH-53A re-engined with two 3925 shp T64-GE-413 engines as Airborne mine countermeasures (minesweeper) versions for the United States Navy, 15 conversion. Stripped CH-53As used for training by the United States Air Force. CH-53A with improved transmission, larger cabin for 55 troops and automatic rotor blade folding for the United States Marine Corps, 126 built. United States Navy mine countermeasures version of the CH-53D, fitted with 0.50 in guns and provision for air refueling, 30 built for the USN and six for Imperial Iranian Navy Aviation (since 1979, the Islamic Republic of Iran Navy Aviation). CH-53D upgraded and improved by the Israel Aircraft Industries to extend life span past 2000. Six unbuilt VIP helicopters for the US Navy/Marine Corps. German base version of the CH-53D for German Army Aviators Corps. A total of 112 were produced including 2 pre-production and 20 assembled by VFW-Fokker and 90 built by Sprey. As of 2007, 89 German CH-53s were in service, with 80 planned to be in service in 2014. All German CH-53s are going to receive T64-100 engines (in 3 batches, 1st batch has already been installed, 2nd batch is currently being installed and 3rd batch is planned with funding made available). All will receive IFR-capability. Update of 20 CH-53Gs with additional missile counter measure, upgraded communication and navigation system and two external fuel tanks in late 1990s. They later received the first batch of T64-100 engines to operate in hot&high conditions as they prevail in Afghanistan as well as MG3 and M3M machine guns. A further update of six CH-53Gs with modern electronics, two external fuel tanks, counter measures and dust filters for the engines, particularly ordered for the deployment in Afghanistan starting in 2009. Update of further 40 CH-53Gs with new flight deck, new flight control system, autopilot, navigation and communication systems, FLIR, ECM and missile counter measures as well as provisions for additional internal fuel tanks. The upgrade is to be completed in 2013. For other variants, see HH-53 "Super Jolly Green Giant"/MH-53 Pave Low and CH-53E Super Stallion. Austrian Air Force ordered two in 1968; took delivery in 1970; sold them to Israel in 1981 because of their high operating costs. Mexican Air Force Acquired four S-65C Ya’sur 2000s from Israel in 2005. Islamic Republic of Iran Navy Aviation has 6 RH-53Ds ordered by pre-revolutionary Iran. Due to its large size and troop capacity, aerial accidents that involve CH-53 helicopters were some of the deadliest helicopter accidents ever. On 10 May 1977, 54 people were killed in a CH-53 crash in Israel. On 4 February 1997, two CH-53s collided in the "Helicopter Catastrophe" in Israel. A total of 73 people died in the accident. A CH-53 from HMH-462 rests on a landing mat at a mountain-top fire support base. The base is under construction by members of the 3rd Marine Division. Two Door Mounted XM218 .50 BMG machine guns. Some have RMWS (Ramp Mounted Weapon System) GAU-21 .50 BMG machine gun. German CH-53GS can mount either two MG3 7.62 x 51 mm machine guns in the side doors, which are to be replaced by three M3M/GAU-21 .50 BMG guns in the doors and one on the ramp. ↑ 1.00 1.01 1.02 1.03 1.04 1.05 1.06 1.07 1.08 1.09 1.10 1.11 1.12 1.13 1.14 1.15 1.16 1.17 S-65 Origins / US Marine CH-53A & CH-53D Sea Stallion, Vectorsite.net, May 1, 2006. ↑ 2.0 2.1 2.2 Frawley, Gerard: The International Directory of Military Aircraft, page 148. Aerospace Publications Pty Ltd, 2002. ISBN 1-875671-55-2. ↑ USAF HH-53B, HH-53C, & CH-53C, Vectorsite.net, May 1, 2006. ↑ Lance Cpl. Samuel D. White. VMM-263 ready to write next chapter in Osprey program. Retrieved on 2007-03-10. ↑ Operation “Rooster”— Israel Captures Egyptian Radar In War of Attrition, Jewish Virtual Library. Retrieved March 16, 2008. ↑ 8.0 8.1 Eden, Paul. "Sikorsky H-53", Encyclopedia of Modern Military Aircraft. Amber Books, 2004. ISBN 1904687849. ↑ Yas'ur 2000. Israeli.Weapons.com. Retrieved on 2007-03-10. ↑ CH-53D Sea Stallion, Deagel.com, accessed 2007-03-10. ↑ CH-53A/D/E Sea Stallion and MH-53E Sea Dragon, US Navy. ↑ CH-53D Fact File, US Navy, 17 May 1999. It uses material from the Wikipedia article "CH-53 Sea Stallion". This page was last edited on 9 September 2008, at 16:58.